Our country doesn’t win anymore. We used to. We lose on trade, we lose with Isis. With Iran. We don’t win. These folks, CNBC. $250,000 for a 30-second ad. Nobody wants to stand up here for 3.5 hours. They lost a lot of money. Everybody said it was going to be 3.5 hours. I renegotiated it down to two hours so we can get the hell out of here. In this one, the media, especially the debate moderators, got the noodle. 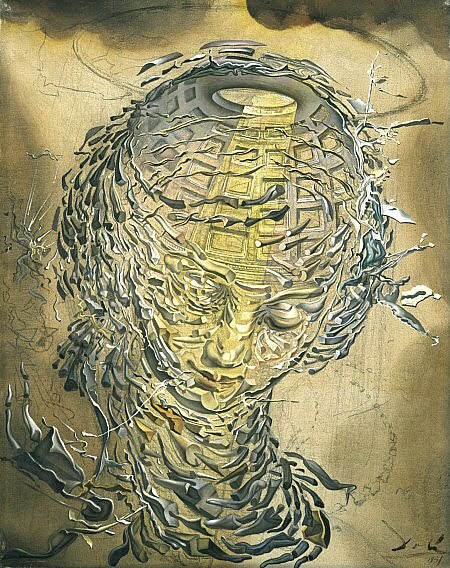 (Illustration: ‘Exploding Raphaelesque Head,’ by Salvador Dalí, found here). That wasn’t really because of the candidates, though — it was because of the moderators. For the first hour, CNBC moderators Becky Quick, John Harwood, and Carl Quintanilla didn’t let candidates interact with each other, resulting in multiple moments of incomprehensible yelling. This may have been because of stricter time limits — this particular 10-candidate debate was only two hours, while the previous Republican debates have spanned three hours. But constant interruption wasn’t the only problem. At one point, Ted Cruz ripped into the moderators for asking what he called unfair and non-substantive questions. And in two instances, audience members actually booed at questions the moderators asked of Ben Carson and Mike Huckabee. There was even a moment when moderator Becky Quick apologized to Donald Trump, ostensibly for misquoting his position on high-skill immigrant visas. She said that Trump was critical of Facebook founder Mark Zuckerburg, who wanted to increase H-1B visas for highly skilled immigrants. This is true — Trump has been critical of Zuckerburg for that reason. But Trump said he hadn’t been, and Quick was confused. I didn’t watch any of it — caught the Guardian‘s updates and let it go. Is there any product I can buy in Colorado that would take my mind off this garbage fire of a debate?